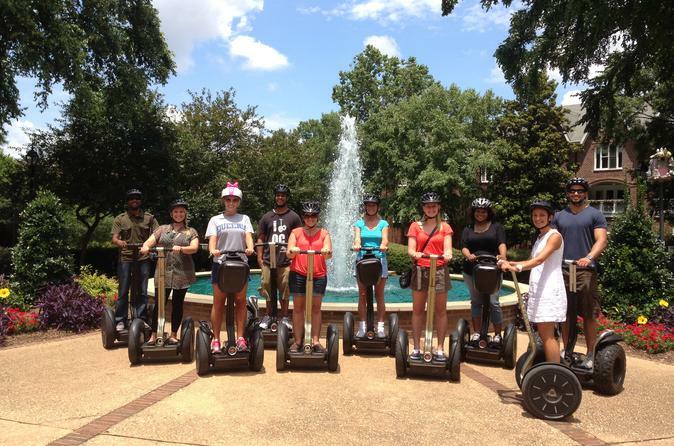 Buzz through Charlotte’s hopping Uptown neighborhood on this Segway tour of North Carolina’s biggest city! Follow your local guide as you glide along the Levine Avenue of the Arts and check out the Mint Museum, the Bechtler Museum of Modern Art, The Gantt Center and the historic Fourth Ward. Choose either a 1.5- or 2-hour ride – the longer ride includes two historic cemeteries and the Carolina Panthers football stadium. You'll meet your guide in downtown Charlotte and get started with a safety overview for the Segway. Once you’re comfortable with the Segway’s controls, follow your guide through the lively Uptown district, with plenty of stops along the way to snap photos and to hear fun stories and facts about Charlotte's history. Wheel down the Levine Ave of the Arts, named after local donors to the arts in Charlotte. On one side of the avenue you’ll see the Bechtler Museum, designed by a Swiss architect and opened in 2010 to show the Bechtler family’s collection of modern art. Check out Niki de Saint Phalle’s outdoor sculpture “The Firebird” – which is covered in mirror mosaic and stands more than 17 feet (5 meters) tall. Across the street you’ll find the Mint Museum, the oldest art museum in Charlotte with one of the largest art collections in the Southeast, and the Gantt Center for African-American Arts and Culture, which presents exhibitions and performing arts. Then pop into The Green, a pocket park lined with sculptures that celebrate great literature. Next you'll travel over to Trade and Tryon streets, a crossroads where two native American trails once intersected, which became the center of Charlotte. Then head into the historic Fourth Ward where your guide will lead you through streets lined with beautiful Victorian homes. This option includes the sights in the shorter tour followed by a visit to the Old Settlers’ Cemetery, Charlotte’s original municipal cemetery which operated for a century starting in 1776. Listen to your guide’s tales of the prominent citizens that were buried here and at your next stop, the Elmwood/Pinewood Cemetery. Finally you'll return to modern times with a spin around the Panthers Stadium, where Carolina Panthers football fans cheer on their team.